Long-rumoured, and much anticipated, Nikon’s new full-frame mirrorless Z system is finally with us. Read our full review of the Nikon Z7. Nikon say that the new models are the most important cameras the company has launched since 1959, the year the F-mount system was born. The arrival brings Nikon, more or less, in line with its mirrorless competitors, whose own mirrorless systems are now fairly established. While the range begins with two camera bodies, namely the Z7 and the Z6, and three lenses, much more is promised over the next few years. So why exactly are there two models? And what are the benefits of this new system? 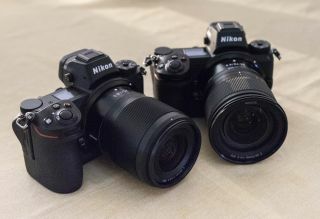 Nikon’s 1-system mirrorless cameras brought a number of advantages over DSLRs, but what Nikon presents with the fresh line is something different entirely. While the two new cameras pack a wealth of pro-DSLR-level technology into their bodies, they have the advantage of being smaller and much lighter than a similarly priced DSLR. Their electronic viewfinders arguably makes them more suitable for use in low light, while the electronic shutter allows for silent shooting – something that isn’t possible on the vast majority of current DSLRs. Unlike the Nikon 1 system mirrorless models that used a smaller 1in-type sensor, the new Z-system cameras each use a significantly larger full-frame sensor. This is the same size as those found inside FX-format DSLRs, and it makes Nikon only the third manufacturer to offer this on mirrorless cameras after Sony and Leica. Although the sensors inside the new Z6 and Z7 cameras share a similar pixel count to the ones inside the company’s D750 and D850 respectively, they are not the same. Both sensors boast special phase-detect AF pixels that enable the same kind of autofocus as DSLRs, and both are designed with a back-illuminated construction for more efficient light capture. These two new models are also the first recipients of the company’s latest EXPEED 6 processing engines. This promises better sharpness and noise reduction than before, and also brings with a new mid-level sharpening option to the Picture Control menu. The new system arrives with a new mount, dubbed the Z mount. Measuring 55mm in diameter, its 17% larger than the F-mount, and works with a new series of lenses. The short flange focal distance, which is the distance between the sensor and lens mount, allows for a more compact body design than would otherwise be the case. Together with the large diameter of the lens mount, this allows for easier illumination at the peripheries of the frame and a wider range of possibilities with lens design. Feature: How did the Z6 & Z7 evolve? The large diameter of the new lens mount will allow Nikon to more easily create wide-aperture lenses. Nikon has stated that it’s difficult to design lenses with an aperture wider than f/1.2 while keeping image quality high on its current FX-format DSLRs, but this new mount gives the company more freedom when desiging these. As well as its long-standing rival Canon, Nikon has lost some ground to other manufacturers who have worked hard to develop their own mirrorless systems. With these latest cameras, and the system as a whole, Nikon has made it clear that its aim is to get back to the number 1 spot for full-frame cameras. The Z7 is assembled in the Sendai plant, which lies just over 200 miles north of Tokyo. The plant was badly damaged in the Great Tōhoku Earthquake in 2011 although it managed to get back on its feet just three weeks later. This is also where the D5, Df and F6 film cameras are manufactured, and it’s where the Z6 will also be assembled.